On a table against the southern wall of the church. 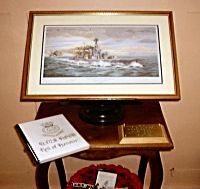 The memorial comprises of a Roll of Honour and a print of the ship. The Roll of Honour was originally compiled by Edwin Greenwood who made two copies, one of which is held in St Ann's Church in the Dockyard; the other is understood to be in Canada. This version is a copy of the Greenwood Roll of Honour and according to the flyleaf was made by Henry Johnston, Inverness in memory of his brother James Johnston, lost off HMS Hood, May 1941. The original contains a foreward by the Admiral of the Fleet The Earl Mountbatten of Burma, which Johnston reproduced, and lists the names, ranks and serial numbers of members of the crew that perished in the battle with the Bismark. Although there has been some disagreement in the exact number of men who lost their lives, the official records confirm that 1,415 men are missing, presumed dead. The Roll of Honour includes all of their names but there are some discrepancies in the details. Some were misspelt and there were several Free French on board who took Anglicised names to protect families at home. To see a complete and accurate Roll of Honour visit the HMS Hood Association web site. Detailed information about each man, where available, is also available on the site. It should also be noted that not all the names on the Roll of Honour appear on the Portsmouth Naval Memorial which records only those men assigned through Portsmouth who were lost at sea. Also on board were 7 men assigned through Plymouth, 7 through Chatham, 4 Polish and 3 Canadian Officers. The accompanying print is by Simon Fisher and is entitled 'HMS Hood. The Final Moment. 0600 hours Saturday 24th May 1941'. The print is numbered 2/850. The HMS Hood Association holds a commemorative service in this church each year during May. See also the HMS Hood Memorial in St Ann's Church.